Abstract - One-third of organizations allow maintenance activities on energized electrical equipment at voltage levels that could cause health or human-safety consequences. Accidents, including shock and arc flash, can derail data center operations and cause serious harm to workers and equipment. 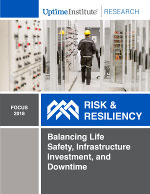 This report covers regulations around electrical safety in the workplace, how to assess the risk of working with energized electrical equipment and best practices to balance life safety, infrastructure investment, and downtime in your critical facilities.